Get it out of drawers and boxes – and onto your walls! Picture framing helps to organize and present your collections and memorabilia. Stamps, coins, vintage letterpress type, medals, and pins are just some of the things we have had fun framing. Music and sports fans often have drawers full of ticket stubs, photos, programs, and backstage passes – why not organize some of these to tell a story and share your passion? Collages and shadowboxes also make great gifts! Create a tribute to a family member, honor a veteran, or commemorate an anniversary with a unique three-dimensional collage. We can also create acrylic display boxes for special objects. Let us help you with the design part! A photo of Abraham Lincoln is paired with a framed document signed by the President. We preserved this family heirloom with acid-free linen matting and Museum Glass. The dark inset frame and bronze filet were selected for dimension and elegance. An acrylic display box is a great solution for many objects. This delicate cake topper was too precious to leave in storage, so we designed a linen platform and clear acrylic display box to protect it. 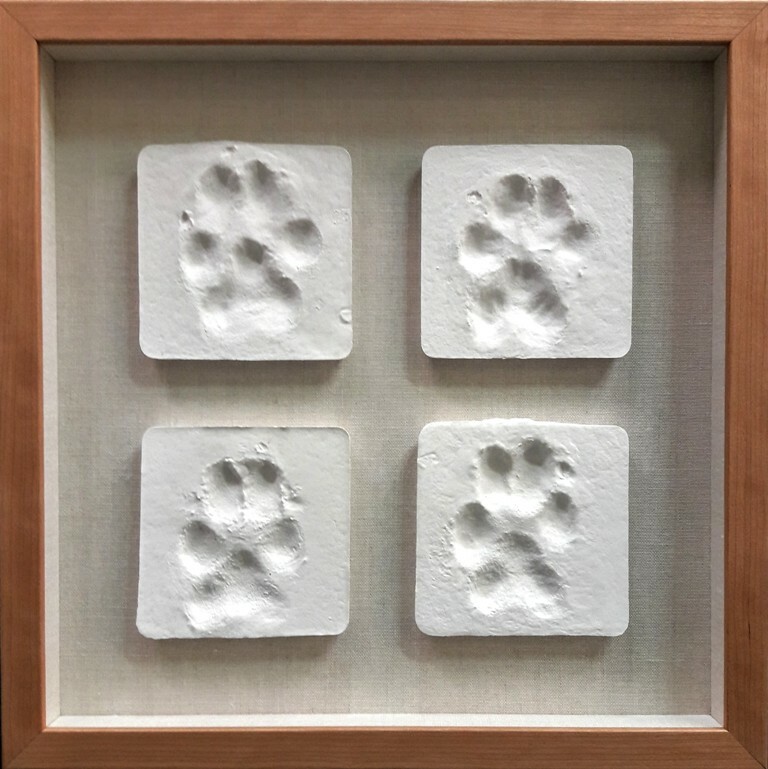 Plaster paw-prints in a shadowbox design on neutral linen create a special memorial to a dear pet. The frame color was chosen to reflect the dog’s coat. We’re honored when our clients bring projects like this to frame. A special concert ticket, program, and autographed card are set into a rich brown mat with red accents to add a jazzy touch. The design is completed with a stacked black lacquer frame and Museum Glass for maximum viewing enjoyment and protection. A large collection of African-American commemorative stamps were organized into a balanced presentation on a taupe mat surrounded by a blue border. Our framers have the experience to help you create visual order from your collections. A group of medals, pins, and patches commemorate a lifetime of military service. A photo in uniform completes the theme of this heirloom piece, framed in polished wood with a gold accent and deep blue suede matting. Remember the Time You Hit a Hole-In-One? Framing Tells A Story. A shadowbox is a great way to tell a story. The score sheet, gold ball, and photo of this memorable event are cleanly organized inside a black frame. Double matting adds style and a touch of color. A client's collection of vintage lead type from European flea markets made a great display on a rough-weave linen backboard. Each block was mounted securely and a narrow walnut frame completes the design. You can't go wrong with black frames and white conservation mats on original photographs. This collection was framed individually and hung as a collection. Repeating the same frame and mat proportions helps visually organize the concept. Ask about our installation services!